When quality is important the more information you record the better! 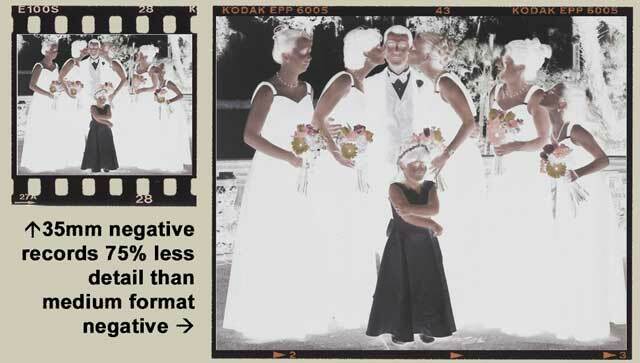 Standard 35mm negatives record 75% less detailed information than professional medium format film and less than most professional full-frame digital cameras. It is the same with smaller-sized digital sensors. The more information captured initially, the more quality options you have later. Most people relate this to enlargements. When you make a 16" x20" print from a 35mm negative or small digital file you can see the imperfections and the image is slightly 'fuzzy' all over. Whereas a 4x6 print may look just fine. This is because the lack of detail information becomes more apparent on enlargements. (This is even more apparent on the old 110 or disc cameras or today's consumer 'point-n-shoot' cameras as the negative or digital sensor is much smaller than the standard 35mm size.) A digital picture on the internet may look just fine but it takes at least 4 times more information for that digital file to print decently at the same size. In photojournalistic photography often 35mm film is used for black and white images as most publications usually print photos small or the quality isn't as critical. 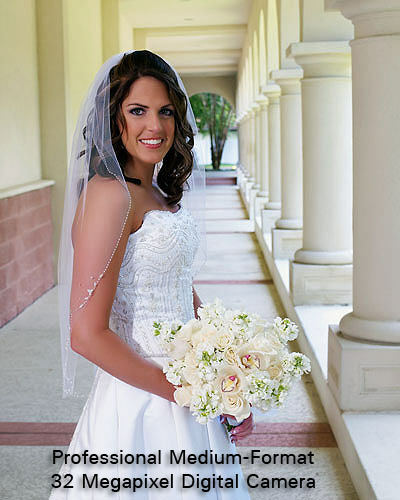 Today's trendy black-and-white wedding photography often plays on the 'lack of quality' in the 35mm B&W image and renders photos that are sometimes a little blurry, grainy or less detailed. These 'special effects' often make the black and white images more artsy and etherical. Although they lose their quality when printed any larger than 11x14. Prior to 2005 film capture had a much greater dynamic range than digitally captured images, today due to continuing advancements in sensors, processes and printing technologies the characteristics of a properly developed digital print now exceed that of a film print. The simple minded would have us believe that the world is only black and white, reality is there are lots of shades of gray. Black and White film has a much greater dynamic range (up to 9 stops) than color film (up to 7 stops) or professional Medium Format digital sensors (now up to 12 stops) and is able to capture all those various and diverse shades of gray which add a much greater depth and richness to an image making it so much more interesting, fulfilling and rewarding. Large group photos should have maximum details so you can see each persons face clearly. 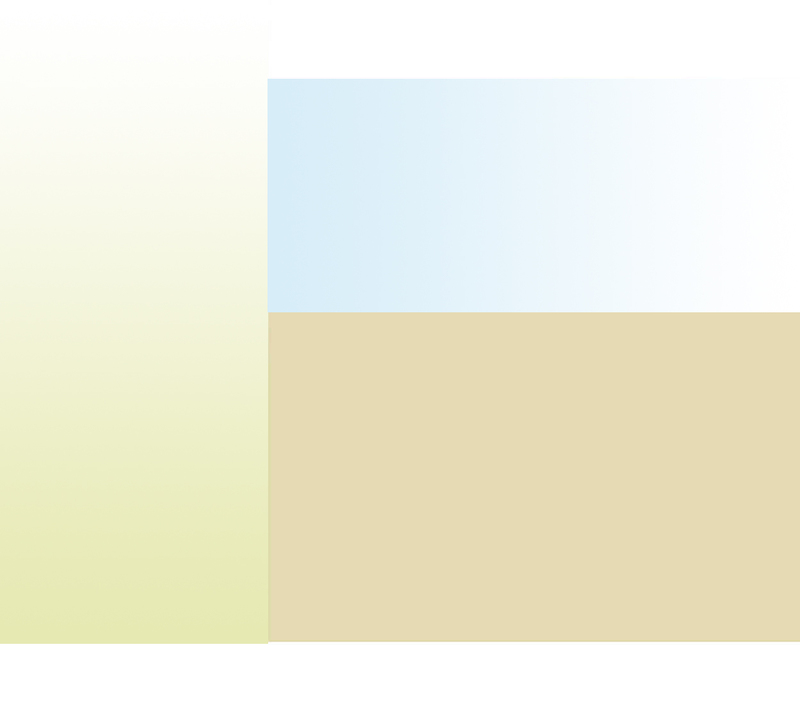 A 35mm negative, 'full-frame' or 'half-frame' digital sensor will produce inferior quality compared to medium-format film or medium-format digital. Some people say the better quality doesn't matter unless you were planning on getting a 'big' enlargement. Even though you may not be planning on getting a big enlargement, the quality can become an issue if you crop or edit a photo for your album. It's these little quality details that truly separate the professionals from the others. 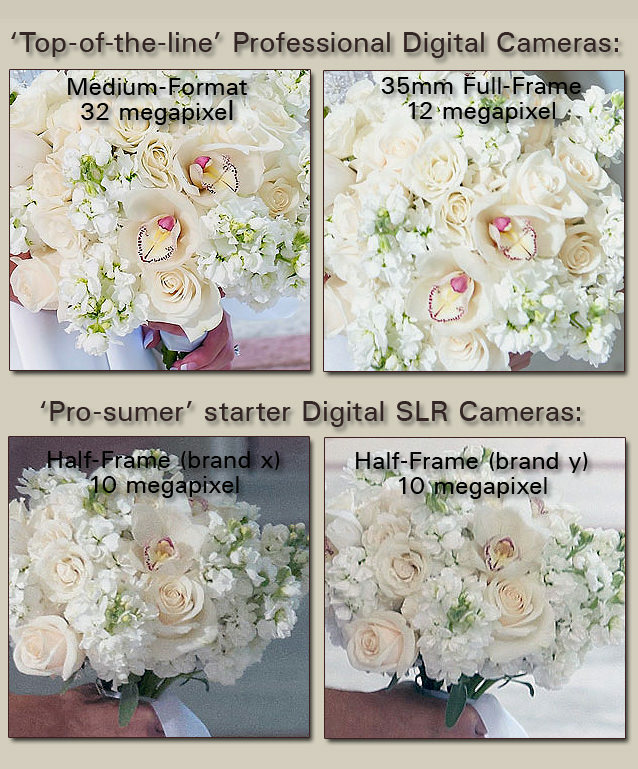 Medium Format Digital has an unsurpassed clarity (at any size) unachievable by smaller cameras. We are pleased to continue to offer and maintain our top-of-the-line quality at a fair price. We're not cheap, but we are well worth the money spent! Set an appointment today to discuss your specific needs. Medium format equipment is 100% professional and therefore designed to the demanding specifications of the true professional. Today we shoot the best quality 32 mega-pixel digital files in RAW format which allows for better quality than medium-format film. We prefer the Top-Quality professional lenses designed by Carl Zeiss. If you don't like it, we will re-do it!